This brand new Executive Villa features 4 bedrooms, 3 bathrooms (two master suites, one king and one queen), 3rd room of queen and 4th room of two twins, large private pool (30'x15') and Spa - SOUTH facing, 42' LED TV (plus TV in three other rooms), high-speed internet with WiFi, large corner lot privacy. The villa has more than 2,000 sqft living space. It has the brand new luxury furnishing, and professionally decorated, and the new hardwood flooring, two-car garage, laundry room, fully loaded kitchen. 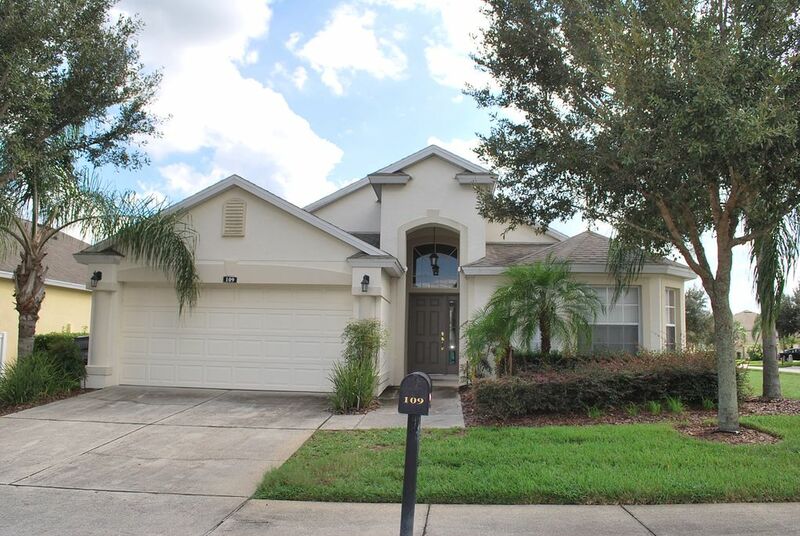 It is located in the 'Hamlet at West Haven' community, a gated resort community off Ronald Reagan Pkwy and I-4, next to Champions Gate golf complex and Omni resort, just 10 minutes from Disney world main gates. This villa is locally managed 24/7 available. Could be nice get away place if property mgr, prop. mgmt. co. and owner would be helpful. Would give this stay a negative # if that were an option. It didn't deserve even a one. The whole first week of our stay was a fiasco of phone calls and waiting for problems to be taken care of. We arrived on Friday March 1 and after we unpacked we discovered the tv's weren't working. After a # of phone calls, we contacted Spectrum cable and they said they would be out Sat. So we had no tv the first day (service had been shut off). Then on Sat evening it got cool in the house so I turned up the heat, no heat. After getting the runaround from Mary (the property mgr) with wrong phone #s and no answers, I called the mgmt.company and got the same wrong phone #s until I got upset and finally spoke to the right person who gave me the # for Ken the maintenance man. He finally came on Monday afternoon but didn't know what the problem was so he called an HVAC person who came at 8:30 PM and did get it going. He said neither heat nor AC were working. There was no remote for the garage door and I emailed Mary 3 times about it with no response. So each time we went out we had to back the car out, go in and shut the garage door, go around to the entry door and lock it, leave the key in the lockbox (they wanted the key left there whenever we were gone) and then do the reverse when we came back. It was extremely inconvenient especially if we didn't leave the porch light on all day and had to fumble in the dark to get the key. Next issue was the screens in the pool area. Numerous ones were ripped or loose from the frames and bugs were getting in and a number of geckos were inside the pool area. The neighbors said it had been that way for months. I told Mary about it numerous times but no response. Finally, the next Friday we noticed after we came back that someone had been there and fixed only 2 screens and left at least 6 others that were loose from the frames. The West screen door was also ripped and they left that. The screen for the patio door was bent and wouldn't shut so we couldn't let any fresh air in. We gave up on calling about it because no one responded anyway. The fridge ice maker was froze up but I got that fixed. One closet door was off but I fixed that. We had to move to the 2nd bedroom because the king bed had supports missing. We asked for a partial refund but no response. We strongly feel that this property be removed from your website. We were in town for my Mom's funeral so just really needed a place to sleep. For that it worked but it needed some tender loving care. One of the bathrooms was dirty. There were smudges, the walls were in need of a paint job. TVs did not work. OK if you just need a place to crash but not if you will be spending time there. My best friend and I planned a getaway trip for the both us and stayed in this beautiful home. Everything was clean and just as the pictures showed. We had everything we needed to enjoy our stay. The only issue we had was that the alarm of the house just kept going on we had to turn it off from the breaker which left the main room and bathroom without electricity. Which wasn't a big deal due to the fact that the house was big and there was a ton of rooms we definitely enjoyed our stay. My husband and our three kids stayed here and it was everything we expected plus more. It only took minutes to reach all the theme parks and a short drive from the airport. Our kids thoroughly enjoyed having there own disney themed bedrooms. We decided to heat the pool which we were glad we did as we all would take a swim after returning from a fun filled day. We will definely come back to Florida and rent this Villa. The Villa is very spacious and beautiful.